Pajman Jassim Holds the Principle of People First Above All Else. In our country, so much is controlled by money and power, including the power of the government. Lawyers who represent people in the courtroom, in jury trials, have the power to fight against enormous billion-dollar companies and to achieve justice for real people who otherwise have no voice. In the end, this is what I love about being a lawyer—helping those people who do not have the power to help themselves,” says Pajman Jassim, Founder of Jassim & Associates located in Emerald Plaza in downtown San Diego. “We serve our clients, not just the bottom line. We truly care about the outcomes for each and every client and case, and make sure the client is happy with the results,” he continues. To that end, the clients and cases that Jassim and his colleagues take on include injury cases, employment cases of all types, and general civil matters including construction litigation, real estate disputes, family law matters, professional negligence, trust and estate litigation, and others. However, Jassim is incredibly forthcoming when explaining that he adheres to a quality over quantity practice philosophy, and is therefore selective about the cases he and his team will take. Jassim’s desire to help others has been a part of who he is for as long as he can remember. Similarly, his dedication to ongoing educational opportunities—whether through attending the prestigious Gerry Spence Trial Lawyers College, learning from his peers through collaboration, or even learning from his opponents—is in his DNA. “I was raised in a household that placed an enormous amount of importance on education. My parents were born and raised in Iran, and came to the United States in the early 1970s. My father worked his way up from being a busboy to a restaurant owner and entrepreneur. I believe that since my parents worked so hard to raise my brother, sister and me here in the United States, we were given opportunities to receive a great education,” Jassim says. He is candid when saying, “It was overwhelming to try complicated civil matters in courtrooms so early in my career. 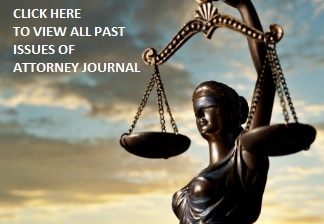 But it taught me very early on about the pressures and the skills required to be a great litigation and trial attorney.” In the years that followed he continued to represent business clients and individuals in injury and employment matters, and by 2009, he found himself invited to attend Gerry Spence’s Trial Lawyers College. From there his passion for plaintiff’s work multiplied exponentially. By the next year, Jassim says there was no way that he could continue to practice law the way he felt driven to practice law, if he stayed with the firm he’d been with for five years. “I had great relationships with numerous clients at the firm where I was practicing, but after seven years in civil practice, I decided that the best way to serve clients and achieve my ideal practice was to establish my own firm. It would allow me the discretion to help any client I wanted in a manner that served the client. I would have the freedom and ability to accept cases that I believed in, and to decline those that I did not believe were well suited for me,” he says sincerely. “I didn’t advertise my new practice or try to take clients from my previous practice with me. I felt that would be unfair to the firm that I was a part of and helped build. So, when I started I had no clients and no employees. I had always believed that the best advertising for a lawyer is to be a great lawyer. That means being a compassionate attorney, an accessible attorney and taking the time to explain complicated legal issues in a clear and simple manner so your clients have the ability to understand and provide meaningful input into their case,” he explains. Jassim certainly gives everything he’s got to his clients, whether he is helping a person who has been injured or helping an employee who has been wronged. “As a civil litigator and business litigation attorney I’m not aware of any attorneys who also have a deep interest and desire to represent individuals in employment and injury matters. By the same token I’m not aware of any of my colleagues in the Plaintiff’s bar that handle the variety of business and general civil litigation cases that I do,” he says. Yet he sees striking similarities between the employment and injury cases in particular. “The most rewarding cases always involve representing an individual or family who’ve suffered some harm. Attorneys cannot undo the terrible things that our clients have endured, but we can fight to have life’s tough problems turned into something positive or at least make things more equitable or comfortable,” he says. When it comes to that fight, Jassim is quick to give credit to his fellow attorneys in organizations such as CASD, CAOC, and fellow alumni from Gerry Spence’s Trial Lawyers College. “There have been a number of times that I’ve teamed up with another lawyer, from TLC. I know that they have been trained the same way and will handle the cases with the same level of commitment, creativity and dedication to the client. Last year, for example, I teamed up with a mentor of mine, Benjamin Bunn, on a significant brain injury case, and I always reach out to fellow trial lawyers across the country to brainstorm and work on cases. In this day and age, if you want to give your client the best chance at justice, you have to use every resource at your disposal. Often that means picking up the phone and talking to other lawyers no matter where they are, and teaming up with them if the case calls for that,” he says. “As trial lawyers, a lot of us are in small firms, but through Consumer Attorneys of San Diego, and Consumer Attorneys of California, we can band together, so it is as if you have a huge firm backing you. We are out here protecting often single human beings, members of our community, and we are sending a message to large corporations that it is not ok to be careless, or to break the rules because you put profits before the personal safety of the community,” he says. But Jassim doesn’t single out his fellow trial lawyers in the Plaintiff’s bar for supporting him, and his clients. Instead he raves about the civility and general friendliness of the entire San Diego legal community, citing opponents as an additional source of inspiration and support. Finally, Jassim also says that the ability to brainstorm with his wife, personal injury attorney Parisima Roshanzamir, has been invaluable in seeking justice for his clients. “It is great to have your life partner understand the nuances of being an attorney and sharing ideas about cases. We chose not to work together, because we wanted a divide between our law practices and our personal life, and neither of us wanted to wind up being the other’s boss,” he says with a laugh. “I can easily say however, that more than once her perspective has made me view a case in a different light.” Regarding the future for Jassim, and his growing team of attorneys, paralegals and office staff, suffice to say, that all signs point to continued growth and victories. Jassim has already been named a 2015 Super Lawyers Rising Star, in addition to being selected as one of San Diego’s Best Attorneys 2015 by San Diego Metro magazine. Likewise, he was named a Finalist in the Rising Star Category for the San Diego Business Journal’s 2015 General Counsel Awards.